SLUG Magazine presented The Beast Mode Tour, which included Cervello Elettronico, Statiqbloom, WMX and Blush Response. They stopped to have their sermon heard at Temple at Area 51. The event took place on Oct.1st—there could not have been a better way to start off my favorite month of the year. I had the opportunity to jack into the “Electronic Brain” David Christian, aka Cervello Elettronico—who is on the Hands label. The interview provided me with more understanding about how his circuitry works and how he personally defines his sound. SLUG: What was occupying your time musically before Terrorfakt and Cervello Elettronico? Cervello Elettronico: I spent many years trying to figure out how to play other people’s music before I wrote my own. In the late ‘90s and early ‘00s, the Internet was playing a pivotal role in facilitating basement musicians who only played one instrument but wanted to paint full pictures on the canvas. I was definitely was one of those people. 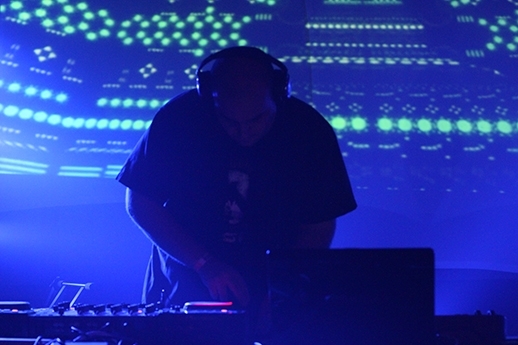 Anything I’ve done with Terrorfakt in the past was strictly live and never recorded properly. I always wanted to work with Benjamin DeWalt in the studio, but it was never the right timing. SLUG: When and why did you decide to move from New York to Los Angeles? Cervello Elettronico: New York lacked inspiration for me. My youth spent in Queens gave me a wealth of influence, but things felt stagnant before I left, around 2008. I needed to be somewhere I could interact with other artists. Today, Los Angeles has the most provocative music right now in America. There’s something interesting to experience almost every night of the week. The most important thing for me as a musician is to interact with other artists and peers. New York had lots of limitations for me and I wasn’t able to find my space there. SLUG: What inspired you to start your own music label? Cervello Elettronico: Originally it was intended to be a way for me to release my own music (since the label I started working with ceased to exist), but it turned into an opportunity to focus attention on some emerging artists. My favorite part of SquareWav are the remixes. Each release is a cauldron or melting pot creating unique combinations. I believe music labels today have a very different role with artists than they have had in the past. It’s their job to be discriminatory and give full promotional support to their artists, within limitations of course. I get thrilled by every release SquareWav puts out as if it were my own. SLUG: What do you look for when it comes to prospects for your label? Cervello Elettronico: I focus on electronic artists that aren’t signed or majorly established, but everyone is welcome to submit. I’ve trusted my first instincts about every artist we’ve worked with and, so far, I feel like we’ve batted a thousand. SLUG: You are well known for having a strong opinion about sounds that break the barriers of the vast Industrial music umbrella. In the SquareWav forum you have even stated the term “Industrial” repulses you at times. What would you classify your sound as? Cervello Elettronico: Well the label SquareWav itself has no mention about being repulsed by the term Industrial. I listen to every piece of music submitted. I do have personal opinions about it though. Lots of “artists” today are identifying with that blanket term. People are way too liberal with using that word “Industrial.” It’s used as a marketing tool to sell records and become a fashion statement under the false guise of being edgy or eclectic. Taking your band name from A Clockwork Orange reference, trying to look fabulous with terrible makeup, and slapping on some generic sinister sound to your band doesn’t make it Industrial. The only sound I identify with that term today is the one made by provocative acts like High Functioning Flesh, Caustic, Sleep Clinic, Blush Response, Statiqbloom. There are artists who push the envelope and combine minimal techno with original industrial. Producers influenced by Coil and Einstürzende Neubauten are doing very exciting things right now. The sound of my project varied in the past but at the moment, if I had to classify it, the music would be Techno- and Industrial-influenced electronic music. SLUG: The core mechanics of Anima Meccanica seem to be a very soft down tempo and less aggressive than some of your past releases. Why did you choose the softer, slower direction? Cervello Elettronico: If by less aggressive you mean less distorted, then yes, it is. I actually think the music I’m making now is harder than ever. I’ve learned that if everything has one level of noise there’s no dynamics and it gets boring. Of course that stuff has its place in experimental music. A few of the tracks have more dance floor friendly BPMs than any of my previous material. I found that DJ’s were speeding up my tracks and that sounded weird to me so I needed to adapt. SLUG: What do you think when you hear another artist’s interpretation of your music in the remixed formats? Cervello Elettronico: I get really excited. As I mentioned before, I love interacting with other artists. I think it’s interesting to hear different ideas bloom from the music I’ve created. Recently Squarewav released its first physical product, which was a split between Cervello Elettronico and Marching Dynamics. That has some of my favorite remixes on it, including one by Swayzak. SLUG: How many festivals do you usually play during the course of a year? Cervello Elettronico: Not very many. It may seem like a lot, but probably once or twice a year. I haven’t been playing as many shows as I have when I first started out because I’ve been focusing on the quality of the performance and a shift to hardware instead of software. SLUG: Do you have a favorite? Cervello Elettronico: One of my favorite fests this past year was Forms of Hands. It was at an incredible venue, with all my label mates, and lots of dedicated, excited fans. It was quite an experience. SLUG: As one who frequently travels the globe, where do you say the largest resurrection of our obscure dark music community is taking place? Cervello Elettronico: Speaking purely about dark electronic music I’d say that Los Angeles, Berlin and Mexico City have the largest amount of fans and activity. SLUG: Is there anything you would like to add? Cervello Elettronico: Just that I’m really super excited to be touring with three other exceptional acts. Not one moment of each show should be missed. There is no headliner, every performance is unique, and we really put a lot of effort into giving everyone their money’s worth. We hope to meet lots of new and old fans. I knew there was something extraordinary about this act when I was approached by another writer who was asking to interview Fade from Statiqbloom—the second act of the evening’s line up. It was obvious that the industrial greats Skinny Puppy had a major influence on this man. With tracks like “Separate Worlds” and “Atrophy of Three” he showed how he has taken the legendary sound and made it his own. The crowd seemed totally enthralled by what they were hearing. When he chose to use effects, they were minimal and were very tastefully done. Echoes of madness and rhythmic screeches captured my full attention. The music made me numb to my surroundings which was a very welcomed escape from the pressures of daily life. The only thing I was focusing on was what I was hearing—a much needed enrapture of sound. This act was more of an industrial act than power noise, providing variety to the evening’s line up. This is most certainly an artist to keep an ear out for. When WMX took over the stage, it appeared as if the room became louder and the beats pounded harder. Gustavo Aldana was fully energized as he played his set. His hands were spinning knobs and pushing switches and his body was bouncing to the beat. I was amazed at the sounds that I was hearing—they were organized noise, which was something I was surprised about. It looked as if he was just turning knobs and pushing switches in an aggressive manner, which should have sounded chaotic. It was amazing chaos. My body began to move. It was not the obvious drum beat or bass that provoked my movement, but something deeper. This music had many layers to it. I contemplated if the others in the room were following the same beat, but the music pulled me deeper into it making it my main focus. The underlying loops and sequences were what was carrying me away. The layers in the track “Percept Sequence” give an example of how the artist creates his sound. This is clearly the best power noise act I have seen. The fourth act of this tour full of headliners was New York City’s Blush Response, a newer and talented artist who has worked with some of the best in the industry. I was filled with glee when he opened up with the track that is my personal favorite “Black Sun.” Although his music was amazing, his set in itself seemed to be very short. The crowd and I really wanted more from him. He counted down every track as he played which appeared as if he was rushing through it. I pondered about why this was, and came to the conclusion that it is either a new experience for him to be on the stage by himself, or he was performing as a new project. He is a musical veteran in some areas, but seemed a little green during this performance. I see a lot of potential in this young artist and feel in time he could quite possibly develop into boundary breaker. He put a fresh new twist on some of the older technologies and techniques. He appeared to be a very grateful musician as he thanked the audience after every song he played. I was amazed at the evening’s entertainment. Each and every one of these artists have many things to offer and you should check all of them out. I am also pleased to see that each show that comes through town grows. The room was filled with new faces that were really into the music they were hearing.